Let It Be – When I find myself in times of trouble, Manu Ginobili comes to me, bringing that grandpa juice, let it be. Welcome to the 2017 NBA Playoffs, Manu. In all sincerity, it really just wasn’t the same without you. I had a sneaking suspicion all day yesterday, as I nervously awaited tip off, that you would arrive in Game 5. Because of this hunch, there was no controversy in deciding which jersey to put on in preparation for the game. I grabbed my silver (home alternate) Number 20 jersey (my go-to jersey during the 2014 title run) and put your name on my back so that I could have yours. Immediately after you checked into the game, I knew that you were back (pun intended) when, on your first touch, you drove hard to the cup for a score plus the foul and then walked to the free throw line with The Look in your eyes. I’ve written extensively about The Look in the past but I’ve honestly never been more relieved to see it than I was last night. You finished the game with 10 points (on 4-6 shooting), three assists, three steals, two rebounds and a block in 18 minutes. More importantly, you provided what Patty Mills coined that grandpa juice in setting an emotional tone early in the game that gave the #BlackAndSilver the edge we desperately needed in order to regain control in this hard-fought series. So, for the umpteenth time in your fifteen year Spurs career…thank you for saving the day, Manu. Despite all of the noise coming from “expert” land (you know, like allegations that you’re retiring before our eyes), I never doubted for a second that you would deliver in this series. In fact, I guaranteed in my previous post that you’d give us a signature Manu performance against the Grizzlies (guarantees are not something I take lightly). And for the umpteenth time in my seven years blogging about the Spurs, you made me look good. By the way, all of that noise coming from “expert” land got awfully quiet in a hurry after Game 5. Considering that a mob of these “experts” had gathered outside of the AT&T Center yesterday evening before the game and was waiting patiently to pick apart your carcass like a committee of vultures, it must feel pretty good to be back to your hall-of-fame magical best. Keep it up, Manu. Vamos a necesitar con el fin de lograr nuestro objetivo. 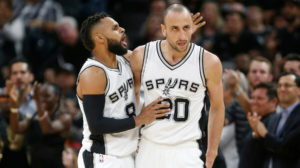 With Manu Ginobili serving as our emotional spark plug, the San Antonio Spurs defeated the Memphis Grizzlies 116-103 in Game 5 of the Western Conference First Round series last night in front of 18,418 bloodthirsty fans at the AT&T Center. Now that’s was I’m talking about when I talk about the ear-piercing noise generated by Spurs fans during the first home game of Fiesta. When Manu drove to the basket late in the first quarter and completed the And 1 for his first points of the series, I could hear the home crowd blowing the roof off of the building all the way from my apartment in Denver, Colorado. (Full disclosure: the fact that I have a phenomenal surround sound system may have had something to do with this.) Man, it pains me to be so far away from the city during this time of year. There’s nothing like being drunk and in the building sipping cerveza during a Fiesta playoff win in San Antonio. Once it hits your lips, it’s so good. Trust me, I have 13 years of experience. As a longtime San Antonian, I can’t wait to get back and experience it again for myself (hopefully in the not too distant future) but for now, I’ll settle for soaking in victories like last night’s by living vicariously through the inebriation of my former friends and neighbors. Capitalizing on the massive home court advantage afforded us by a rowdy Fiesta crowd, the Spurs are now back in front in this emotionally-exhausting series, leading three games to two. With all deference to Manu’s inspirational performance, the player of the game was Patty Mills. After Memphis went on a terrifying run to cut the (once 18 point) Spurs lead down to four with 9:29 left, Mills went bonkers hitting four threes in the frame to reopen a double-digit lead en route to his playoff career high of 20 points. To quote Spurs play-by-play announcer, Bill Lamb, “Good on ya, Patty!” Besides Manu’s and Patty’s, there were several other huge performances up and down the Spurs roster in Game 5. Particularly of note: Tony Parker’s 16 points and 6 assists, LaMarcus Aldridge’s 12 points and 9 rebounds, and David Lee’s 11 points and 8 rebounds. Unfortunately, we somehow got next to nothing out of Kawhi Leonard. Just kidding. The Klaw was his usual dominant self, inflicting another 28 points (on an efficient 9-16 from the field, 3-5 from downtown, and 7-8 from the stripe) and six assists upon the Grizzlies punch-drunk perimeter defenders. If something looks off to you about those shooting numbers it is probably because for the first time in the series, Kawhi Leonard missed a free throw. After entering the game a perfect 40-40 from the line this postseason, Kahwi went ice cold by missing one of his eight free throws last night, dropping his series free throw percentage to .979. Somehow, I don’t think Coach Pop is going to be benching him any time soon. Speaking of Kawhi and looking ahead to Game 6, Thursday presents an opportunity for our small forward to take the next step in solidifying his place as the best basketball player in the world. Since he’s already more than comfortable in his role replacing Tim Duncan as the franchise cornerstone, it is time for Kawhi to start doing some Tim Duncan-like postseason things. Namely, it’s time for Kawhi to start taking the lead role in closing out hard-fought playoff series on the road. In his sixth NBA season, Leonard is roughly in the same place in his NBA career as Duncan was in 2003 (his sixth year in the league). During the 2003 NBA Playoffs, Timmy (coming off of back-to-back NBA MVP seasons) was fully established as the best player in the world at the time. During the 2017 NBA Playoffs, Kawhi still has a lot of people who need convincing that he’s really that good. Playing like the 2003 version of Tim Duncan tomorrow night will be a good way to start silencing the doubters. During the 2003 NBA Playoffs, TD led the Spurs to win three consecutive Game 6 closeouts on the road. In the first round, Timmy had a triple-double in Game 6 leading the Spurs past Phoenix in Phoenix 87-85 to eliminate the Suns 4-2 (TD: 15 points, 20 rebounds, and 10 assists). In the Western Conference Semifinals, Timmy dominated the three-time defending champions in Game 6 leading the Spurs past Los Angeles in Los Angeles 110-82 to eliminate the Shaq-Kobe Lakers 4-2 (TD: 37 points, 16 rebounds, 4 assists). In the Western Conference Finals, Timmy overpowered an in-state rival in Game 6 leading the Spurs past Dallas in Dallas 90-78 to eliminate the Mavericks 4-2 (TD: 18 points, 11 rebounds, 4 assists, 3 blocks). The 2017 Memphis Grizzlies have proven to be a worthy adversary. They are completely capable of winning tomorrow night’s contest at home and then coming back into our building on Saturday night with eyes on stealing the series. This is a perfect situation for Kawhi, like Tim Duncan before him, to gain the experience and accolades that come with battling through the adversity of a tough, emotional series only to rip the opponent’s heart out in front of their home fans in the end (because that’s what the great ones do). While I haven’t enjoyed the anxiety that this tough first round matchup with the Grit N’ Grind Grizzlies has given me over the past two weeks, I’m really glad the Spurs did not sweep the first round of the playoffs. Why am I glad that we didn’t get an easier first round opponent? The Spurs have never one a championship in a year where we swept the first round. 1999 (3-1 over Minnesota), 2003 (the aforementioned 4-2 over Phoenix), 2005 (4-1 over Denver), 2007 (4-1 over Denver again), and 2014 (4-3 over Dallas). Only through figuring out how to persevere through early playoff adversity did past Spurs teams (generally) and those teams’ best player – Tim Duncan – (more specifically) achieve the mindset necessary to survive the later rounds and win a championship. In all five of the first round series mentioned above, the Spurs had to overcome the agony of losing a heartbreaker in the final minutes of an early series game (much like the Game 4 loss in this series on the Marc Gasol buzzer-beater) and dig deep within to find the necessary composure to right the ship. Kawhi Leonard and the 2017 San Antonio Spurs have an opportunity tomorrow night in Memphis, Tennessee to see another soul-wringing first round series through to it’s completion. If Kawhi Leonard can deliver the same type of Game 6 road performance to close out a series that Tim Duncan was famous for (and that helped propel Number 21 to the upper echelons of basketball greatness), the Spurs could very well be off to the races in these 2017 playoffs. Easier said than done (Memphis is not going down without a fight) but if greatness was easy…every player would be Tim Duncan and every team would be the San Antonio Spurs. Kawhi Leonard has the talent to be the next Tim Duncan and these Spurs have the talent to be San Antonio’s next championship team but the proof is in the pudding. Tomorrow night is going to be a dog fight. The challenge is right there in front of us and ripe for the taking. Tomorrow night, no matter how tough the conditions in the FedExForum and how resistant the opponent, all that matters is one playoff road closeout victory. Next post: What’s a Koondis With You?